Choose this design or let us design one that meets your aesthetic, functional and budgetary requirements. We create turnkey rental solutions that include exhibiting essentials such as: hardware, A/V, trade show booth graphics and flooring. Our 20' display rental design features a welcoming open plan design with a display counter to engage visitors. 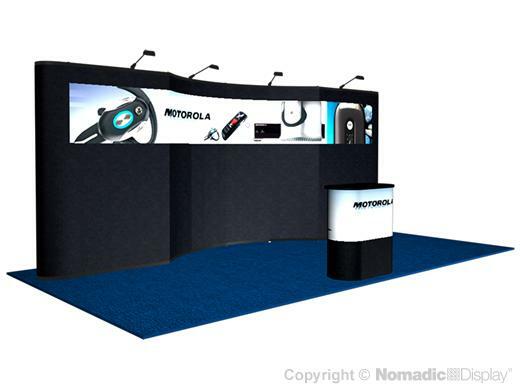 Look good from every angle with large format trade show booth graphics and draw audiences in with dynamic display kiosks. 1 - FlatPack 200 - 10.83" x 29.72" x 52.56"
3 - Rolluxe Case - 41.75" x 16" x 16"
Sacks Exhibits is a global provider of exhibits, events, and environments. For over thirty years, our mission has been to deliver award winning, successful exhibit and event programs for our healthcare, consumer product, automotive, software, technology and clean energy clients. We provide a wide range of creative and exhibition services including custom exhibits, pop up displays, tabletops, banner stands, modular exhibits and custom rental exhibits. Our experience and skills includes event management, national sales meetings and experiential marketing. You are our focus, understanding your brand our passion. We make certain our work is your vision.